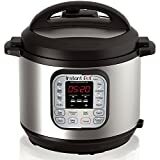 The Instant Pot DUO60 6 Qt 7-in-1 Multi-Use Programmable Pressure Cooker was one of Amazon’s most popular products on Prime Day, and it’s not difficult to figure out why. It’s the hottest selling multi-use cooker on the planet, and it dropped to its lowest price ever. Today’s discount isn’t quite as deep as it was back in July on Prime Day, but the DUO60 is back on sale for only the third time since then, and today’s sale price matches the lowest it has been since Prime Day. If you don’t already have one, today is definitely the day you should find out how this awesome pressure cooker earned nearly 23,000 5-star ratings on Amazon.